If you're trying to go healthier and want to add more fish to your diet, tilapia is a light, white fish that is easy-to-buy and easy on the wallet! The one issue I have with tilapia is it tends to lack flavor on its own. I've tried various rubs and seasoning combinations, but came across this dish in Taste of Home magazine, and we just loved it! 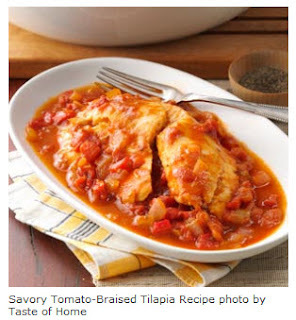 The flavor of seasonings with tomatoes and onions permeates the fish very well, and serving it in the sauce gives added flavor to each forkful. Serve it with a rice dish or couscous, and a side of fresh seasoned veggies. Fabulous! 1. Sprinkle fillet with salt; drizzle with lemon juice. 2. In a large skillet, heat oil over medium-high heat. Add the onion; cook and stir until tender. Add the next six ingredients; cook and stir for 2-3 minutes longer. 3. Place fillets over the tomato mixture; cook, covered, 6-8 minutes or until the fish flakes easily with a fork.